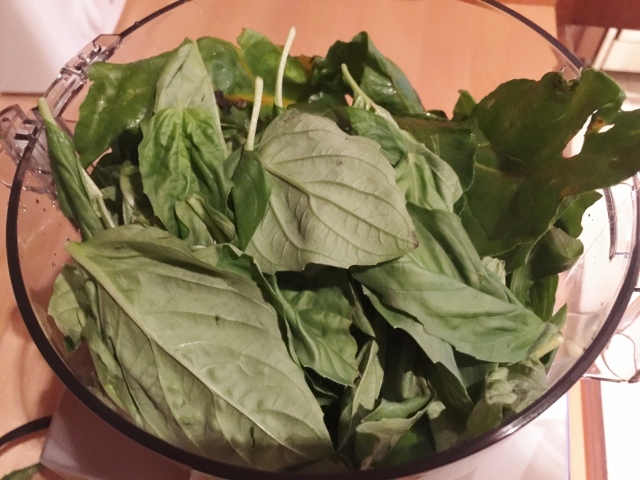 Beet Greens & Basil Pesto - Recipe! - Live. Love. Laugh. Food. 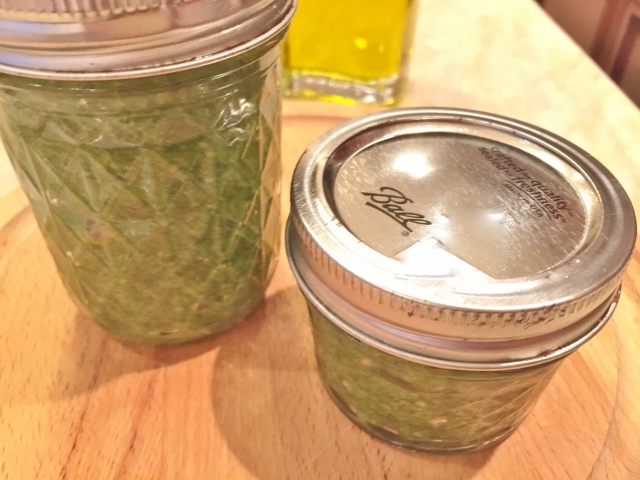 If you are looking for ideas about what to do with those beet greens that you are tearing off the top of your beets and tossing in the trash, Beet Greens & Basil Pesto is the answer. 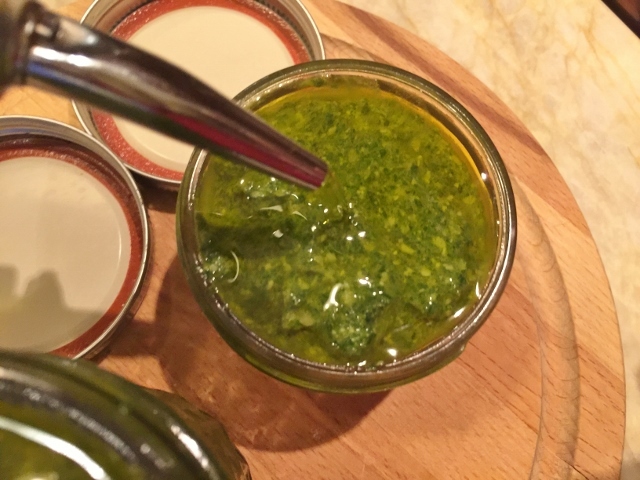 This pesto recipe has a slightly tart bite and rich umami flavor that is great when tossed with pasta, roasted vegetables; like potatoes and carrots, and even dolloped on top of a fresh ricotta cheese crostini. 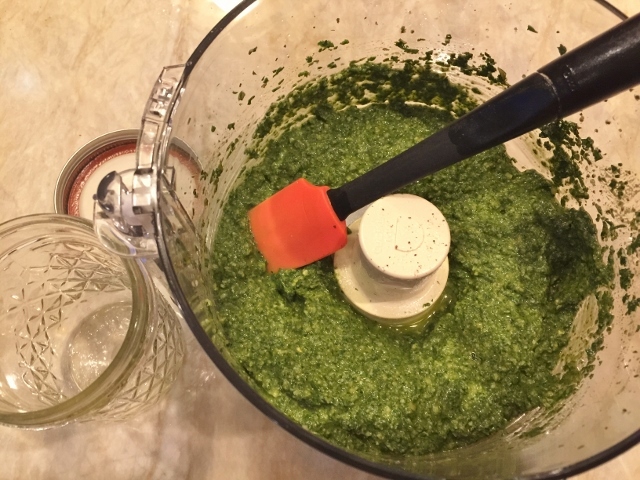 This recipe makes about 12 ounces of pesto, so there is plenty to use at a later date. 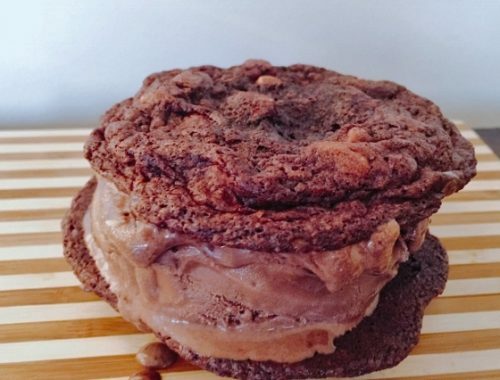 You can store it in the refrigerator for a couple of weeks or freeze it for several months. 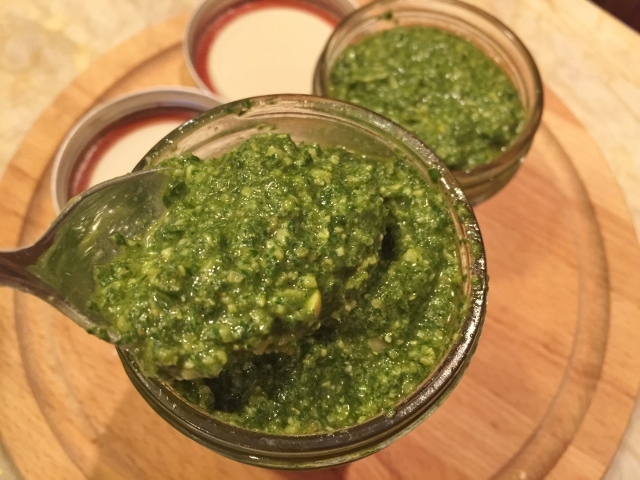 I think this Beet Greens & Basil Pesto is super tasty and it is nice to have on hand, especially when you need to prepare a delicious quick meal or are looking for a delightful vegetarian option. 1. 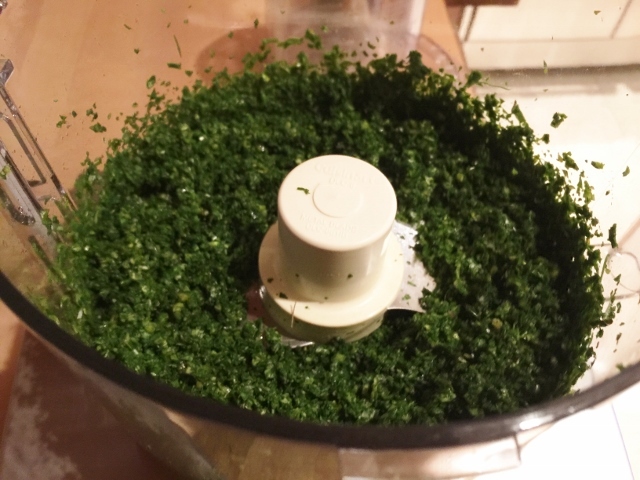 In a food processor, add your basil and beet greens. Pulse 10 times, until the mixture is coarse pieces. 2. 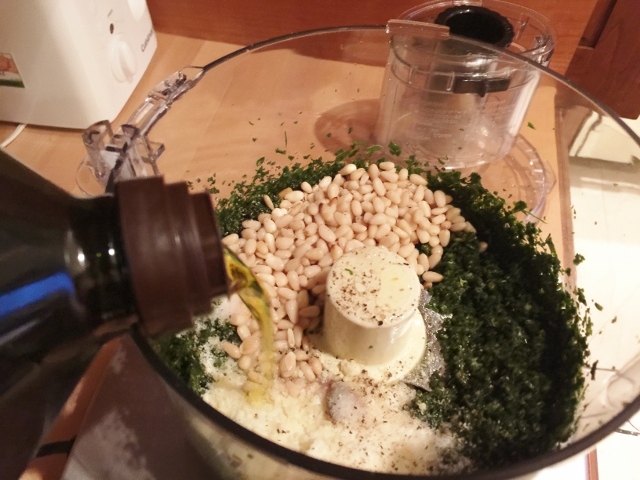 Add the anchovy, Parmesan, pine nuts, 1/2 teaspoon salt and 1/4 teaspoon black pepper. Drizzle in 2/3 cup olive oil and pulse 8 times. The mixture should look smooth, but slightly chunky. 3. Spoon the mixture into jars with fitted lids, leaving 1/4 inch at the top. Pour the remaining olive oil on top and seal. Store in the refrigerator for 2 weeks or several months in the freezer. Enjoy! 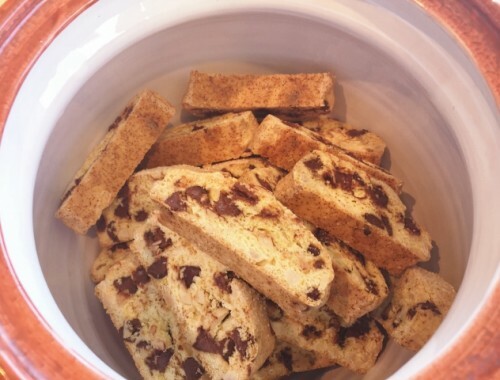 Chocolate Chip Orange Almond Biscotti – Recipe! 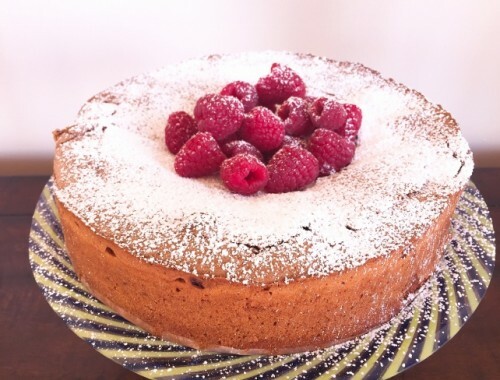 Salted Chocolate Butter Cake – Recipe!